Timeless, masculine, precious – the ideal attire for festive occasions. The dress code request “White Tie” on an invitation demands a tailcoat. A tailcoat is worn after 6 p.m. or more precisely after nightfall. Black top hat, white piqué-west with low V-neck, white shirt with piqué-front, white bow-tie and black patent-leather shoes. No wrist watch, but a pocket watch with a chain attached to the west is worn to the tailcoat. The tailcoat is the most elegant of suits and is solely used for festive events in the evening. No wrist watch, but a pocket watch with a chain attached to the west is worn to the tailcoat. 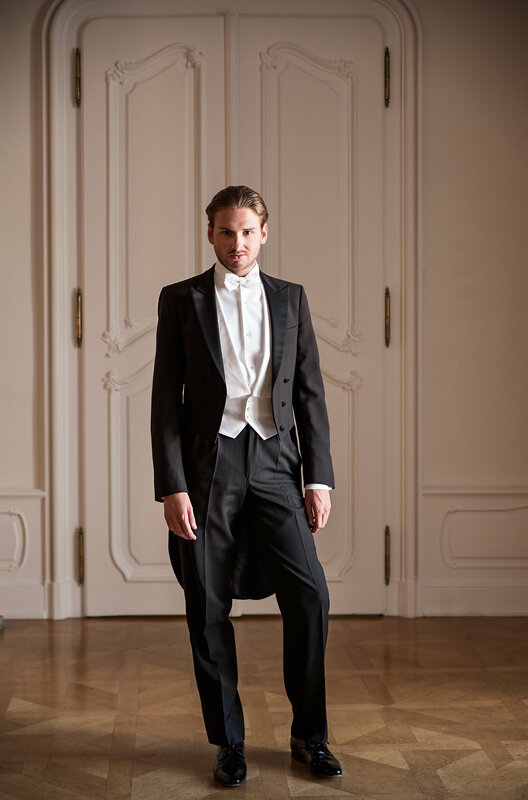 The tailcoat is the most elegant of suits and is solely used for festive events in the evening. The jacket has a peak lapel and the typical fish-tail in the back, it has a high waist in the front and is always worn un-buttoned. The pants have two silk straps attached to the outside of each leg and are worn with suspenders instead of a belt. The shirt has a special piqué-front and separate buttons. In addition, a west and a white bow-tie are worn– both also fabricated of white cotton-piqué. The dress code “White Tie” is very strict and does not allow any individuality for the attendee.